Dougherty & Associates Wealth Planning & Management (Charlotte A. Dougherty, John E. Dougherty III and Andrew Tedesco), a Cincinnati-based registered representative of Lincoln Financial Advisors, has received the Women’s Choice Award, the only recognition program for well-qualified advisors who are committed to the women’s market and serving their female clients. This is the third year in a row that Dougherty & Associates has received this award. Based on rigorous research, 17 objective criteria and additional points of reference that obtain feedback regarding the advisor’s service and practices, achieving this award reaffirms the commitment Dougherty & Associates has to extraordinary service in addressing the financial needs of women and their families. 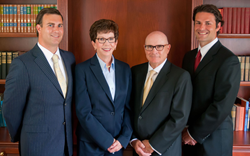 Dougherty & Associates specializes in multigenerational planning and estate preservation. Charlotte Dougherty, president of Dougherty & Associates, is a member of The WISE Group at Lincoln Financial Network, an initiative aimed at supporting the unique needs of female financial advisors and clients. The WISE Group offers programs to help foster greater interaction and support among female advisors to empower and grow LFN’s network of female financial advisors and to help all LFN advisors better serve female clients. Dougherty is a graduate of Miami University in Oxford, Ohio. Dougherty & Associates is located at 4030 Smith Rd. Suite 400, Cincinnati, Ohio 45209. Lincoln Financial Network is the marketing name for the retail sales and financial planning affiliates of Lincoln Financial Group and includes Lincoln Financial Advisors Corp. and Lincoln Financial Securities Corp., both members of FINRA and SIPC. Consisting of approximately 8,500 representatives, agents, and full-service financial planners throughout the United States, Lincoln Financial Network professionals can offer financial planning and advisory services, retirement services, life products, annuities, investments, and trust services to affluent individuals, business owners, and families. Dougherty and Associates is not an affiliate of Lincoln Financial Advisors. Lincoln Financial Network’s WISE (Women Inspiring, Supporting, Educating) Group aims to inspire, support and educate female colleagues, clients and future advisors in the pursuit of knowledge and services within the financial planning industry. WISE assists women financial advisors in the growth and recognition of their practice. This includes support and assistance to advance the technical skills of women advisors, recruiting and developing new women advisors, and providing insight into the female investor to increase financial planning opportunities for all advisors, regardless of gender. The WISE Group also promotes sharing ideas as well as collaboration with financial planning, wealth and risk management to drive increased client retention, dedicated focus on attracting and keeping women as clients and advisors, practice expansion and networking, efficiencies in practice management, and technical expertise.